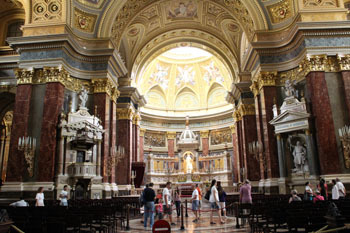 St. Stephen’s Basilica, the largest church in Budapest, is dedicated to Hungary’s first king, St. Stephen. About 8 500 people can get in the beautiful Neoclassical cathedral at the same time. Several musical programs are organised in the church throughout the year. 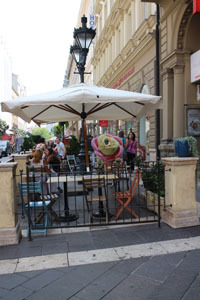 The spacious St. Stephen Square offers plenty terraced cafes and bistros to people watch by a cup of coffee. Open for tourists: Mon – Fri: 09.00 – 17.00, Sat: 09.00- 13.00, Sun: 13.00 – 17.00 Note: religious ceremonies might alter the general opening hours. guided tour in English, and French (prior request is necessary): 2 000 HUF (without visiting the cupola: 1 500 HUF). Note: foreign-language tours are held for a gorup of min. 10 persons. The look-out in the cupola offers a fanatastic 360° view of the city. TIP: Hotel Central Basilica is a fine 3-star Hotel in Budapest City Centre. A great choice if you want to be close to all the sights, restaurants and nightclubs. St. Stephen’s Cathedral has great acoustics that you can experience on an organ concert series on Thursdays at 20.00 performed by one of Hungary’s most talented pipe organ players, Kolos Kováts. 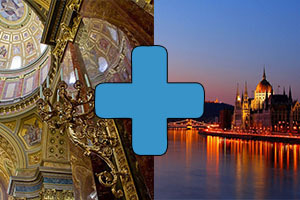 TIP #1: You can combine the concert with a night river cruise on the Danube (includes 4-course buffet dinner). If you reserve the two programs together you save some money. Prices: 59 – 70 EUR, students: 56 -68 EUR. 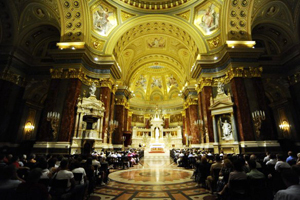 TIP #2: The Church of St. Michael in Váci Street or the St. Anne Church on Batthyány square in Buda also host organ concerts on a regular basis. 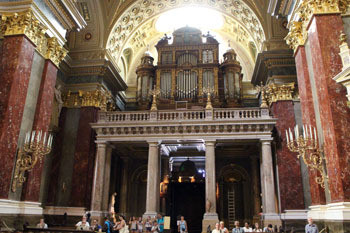 Find more organ concerts in Budapest. It took more than 5 decades and 3 architects to build Budapest’s Basilica. Several misfortunate events delayed the works. József Hild made the designs in 1845 but because of the 1848/49 Revolution and War of Independence works started only in 1851. After the death of Hild, Miklós Ybl, designer of the Opera House took over overseeing the construction. In 1868 the dome collapsed, luckily nobody died. Ybl drew up new plans and building started again almost from scratch. He couldn’t see his work completed, since he died in 1891. 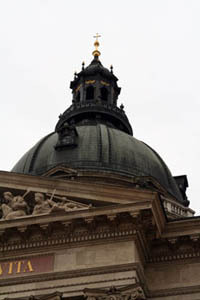 József Krauser finished St Stephen’s Basilica in 1906. According to the rumor, at the consecration mass Emperor Francis Joseph kept looking upwards afraid of another collapse of the dome. The building suffered heavy damages during the bombings in World War II. Reconstructions have only started in the 1980-ies and were finished just recently. 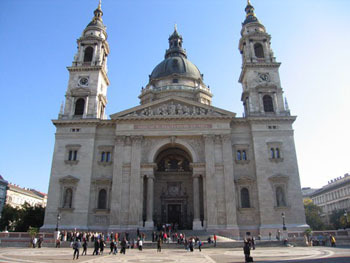 Hungary’s second largest church can take in 8 500 people. It occupies 4 147 square metres. Total height of the building: 96 m exactly the same as that of the Budapest Parliament. The largest bell of the country tolls in the right tower. It weighs 9 tons. 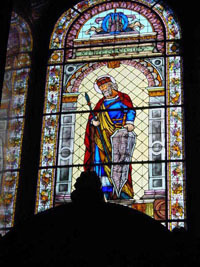 The cathedral has a couple of marvelous stained glass windows designed by Miksa Róth like the one on the photo. 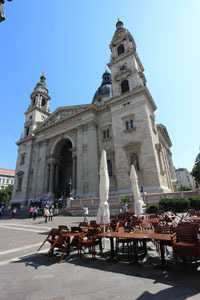 József Hild designed a large neoclassical church similar to the basilica in Esztergom. The ground plan forms a Greek cross. Because of the vicinity of the Danube huge foundations had to be constructed that resulted in an underground cellar almost as large as the subsurface building. Many art treasures and precious documents survived down there the second world war. After Hild’s death, Ybl reworked the plans creating a neo-Renaissance style church. You can recognise Ybl’s work at the main facade and the wall along Bajcsy-Zsilinszky út. Ionic columns and statues of the twelve apostles adorn the outside walls. You can really experience the vastness of the church from the inside. 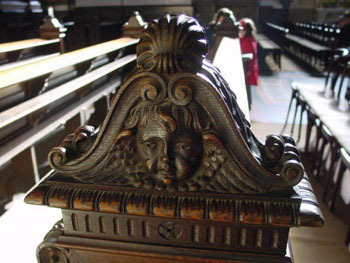 Walk around and view the works of famous contemporary artists who decorated the interior of the chancel. tribes into Christianity, thus managed to found a strong state between Western and Eastern European empires of the era. Although it’s a bit dark inside, you can still admire the marvellous frescoes, statues and mosaics. Main Altar: statue of St. Stephen carved out from Carrara marble by Alajos Stróbl, Gabriel archangel holds the Holy Crown above the head of the king. The 96 m high Dome stands out from the mass of office buildings and apartments in Pest. Four pillars hold the massive structure. A fresco of God the Father dominates the center of the cupola. The Patrona Hungariae Altar by Gyula Benczúr depicts St Stephen offering the Hungarian Crown to the Virgin Mary and asking her to be a patron of Hungary. 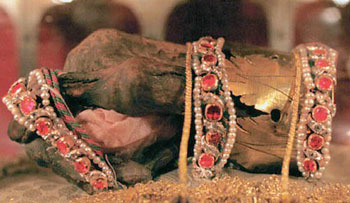 The Holy Right of St. Stephen: You can see the most precious treasure of Hungary, the mummified right fist of King Stephen in a small chapel to the left of the Main Altar. The relic is kept in an ornate glass cabinet. Insert a 100 Ft coin and the cabinet lights up. On 20th August the Holy Right is carried around the Basilica in a procession. You can admire one of the city’s best panoramic views from the right tower. An elevator takes you up until halfway; from there you have to climb up on stairs. You’ll climb out into the inside of the dome in a wrought iron construction, and you’ll get to the space between the outside and inside of the dome. Quite an exciting adventure, but the view will compensate you for the trouble. Tickets: full price: 600 HUF, students, retirees: 500 HUF. You can find numerous attractions in the neighbourhood since district V. is the inner city of Budapest, the centre of business and administration. The spacious Szt. István Square, where the basilica stands, is great for a walk. Two fountains stand on the square dedicated to St. Stephen and to his wife Gizella. 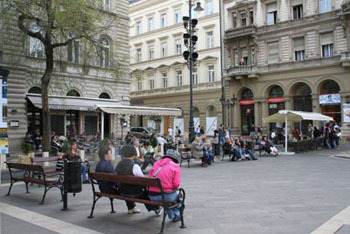 The square is flanked by benches and terraced cafes. You can have a nice meal or coffee in one of the numerous fine cafes and restaurants. A rose is formed artfully from the ice cream making the cool summer dessert pleasing to both the eye and the taste buds. Besides gelato, they have macarons, bonbons, chocolate, cakes, waffles, coffee and hot chocolate. You can enjoy the desserts in the small terrace facing the Basilica. Andrássy Avenue is just a short walk with the Opera House and other examples of great architecture. Vörösmarty Square with the Gerbeaud Cafe is within walking distance too. See other tips on what to see and do in downtown Budapest. the Advent Festival & Fair starting at end of November. an ice skating rink (free for children under 14) lend an enchanting atmosphere to the city’s 2nd biggest season event, the biggest being the Christmas Fair & Winter Festival at Vörösmarty Sqr. Light mapping show, a varied program offer, lots of local food and drinks make this a must-see program in the festive season. 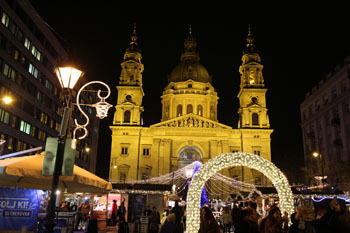 Find out more about the Advent Fair & Festival by the Basilica!